If your aim is to lose weight or maintain a weight loss, you’ll up your chances of success by tracking. The Pescetarian Tracker below is designed to help you account for your daily servings of fruit, starchy carbs, and other Pescetarian Portions. This way, you don’t have to track calories (except for treat calories). 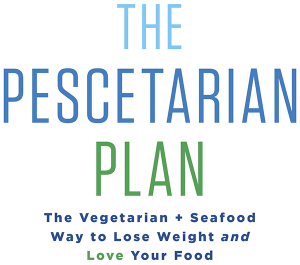 A detailed explanation of tracking starts on page 280 of The Pescetarian Plan. To download a Word version of this tracker, click PescetarianTrackerInWord. * (1 = ravenous, 2= a little hungry 3= neither hungry nor full, 4 = a little full 5 = ugh! Too full).Write down your hunger level before and after eating (i.e. 2/4).